When my Bee traded the Cross Roads to Jericho blocks, one member brought blocks with very bright fabrics. I traded away the bright blocks I received. My quilt is found on page 89 in Simple Strategies for Block-Swap Quilts. Barbara Reynolds kept her bright blocks and added more bright fabric in the setting triangles (page 93). Carolyn Hurst solved the problem by making two small quilts. This is her bright version of Cross Roads to Jericho. 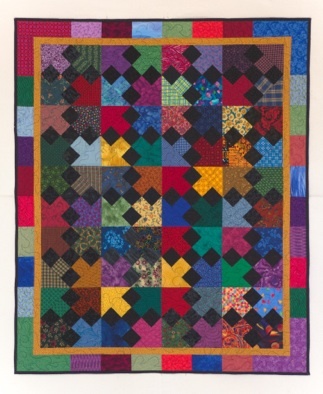 This quilt was donated to Comforters, a charitable project of the Quilt Guild of Greater Houston.